Like the instinct and desire upon which the story is based, the Colorado Ballet's Dracula keeps coming back for more of our eternally sustaining blood, and a good thing it is, for this epic never fails to thrill and chill its audiences. 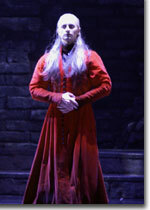 Based on Bram Stoker's famous story, the production contains some of the best dream-sequence and nightmare effects ever performed on stage. And the choreography, a mix of modern and classic technique, is alternately elegant and explosive. With an aggressive schedule designed to satisfy the anticipated Halloween euphoria and director Michael Pink's athletic choreography, the principal roles for the show have been triple-cast. On opening night, Igor Vassin made his mark as the lord of the undead, alternately statuesque and reptilian, slithering like a snake, hanging like a bat, casting spells like Mesmer, and wooing like Valentino. He, in turn, seduces Jonathan and Mina Harker, the always dazzling spritely pair of Sharon Wehner and Koichi Kubo, before turning his sights on his favorite prize, Lucy Westenra, the transcendent and, after a close encounter with the Count, possessed Maria Mosina. Andrew Thompson's psychotic Renfield infuses an already edgy atmosphere with a streak of irrationality, while Gregory K. Gonzales, Oleg Dedogryuk, and Chauncey Parsons provide ballast as Dr. Van Helsing, Lord Arthur Godalming, and Quincey Morris. In addition to Pink's gripping choreography, Philip Feeney's emotive score, performed with exuberance under the direction of Akira Endo, Lez Brotherston's impressive sets and striking costumes, and Paul Pyant's stunning lighting create a mood that, given its live nature, surpasses any of the great films on this subject. 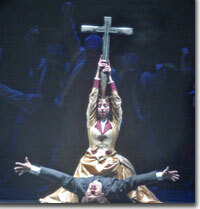 The Colorado Ballet's Dracula runs through November 7th. 303-837-8888, 303-830-TIXS, or www.ColoradoBallet.com.